April 30, 2007. Your webmaster took these pictures in September, 1999, long before this website project was conceived. We need to find her again. And we did! See below. 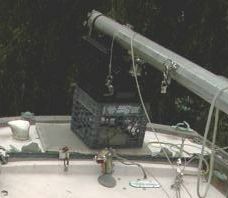 Note the transom hatch, no stern pulpit. Somebody must recognize this boat!. 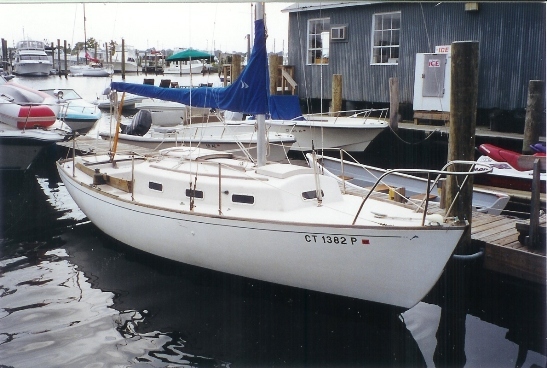 October 6, 2008 - Going through some old files generated in 1999 when looking for a Dolphin for son Michael (Passage) I found the following notes: "This boat was then owned by Herman Jessup from Hebron?, CT. A former owner was Milt Holridge; a former name before Enticement was Wisp. She has an 8hp Palmer inboard and was reported to be light and gutted for racing"
March 5, 2009 We got the following email from Mark Steinhilber (Rascal). Your webmaster needs all the help he can get connecting dots - I really missed this one. Mark 'surfaced' as a consequence of the cleaning out of his father's garage and the discovery of some of his father's sails for Rascal. Besides a keen eye out for webmaster errors, he has provided a wealth of information about early Dolphins, much of which you can see by going to Rascal's page. Click here to go there. Enticement became Cynosure. Look at the CT numbers on the bow in the Cynosure photo at left. If gutted for racing, might be a Lunn, but the clam shaped handrail suggests Marscot. March 9, 2009. An interesting coincidence. The Dolphin 24 website is backed by what is getting to be an extensive database which is used not only to record the history of our various Dolphins but to help 'connect the dots' between the various boat names a boat has had over the years. I first found Enticement from a picture I took nearly 10 years ago when I was looking for Dolphins my son might want to buy and restore. I stuck that photo in a file marked eastern Connecticut Dolphins and promptly forgot about it as he bought Passage. 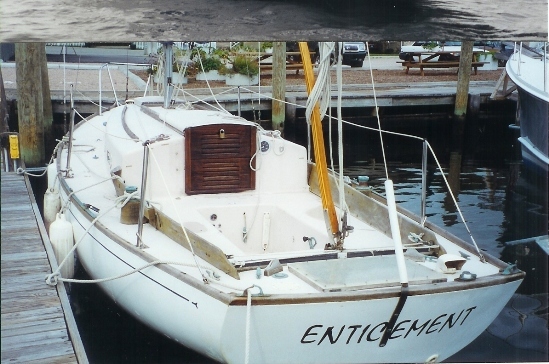 Eight years later, I decided to do this website, found the file, scanned the Enticement photos, and created this page, saying to myself that someday I would find out more about this boat. In July, 2007 I saw an ad on CraigsList for a Dolphin in Cheshire, Connecticut and eventually contacted the owner, Tom Bimini. With his information, and what was in the ad, I created a webpage for that boat we know as Cynosure. When I spoke with him I thought he said the name of the boat was Eyenosure, and created the page accordingly. The alphabetically based database entry sorted itself automatically and appeared immediately below the entry for Enticement. As time went by I found out the correct name, Cynosure, and corrected the webpage. But, one of the idiosyncrasies of the database is, while I can change the page content - the boat name, etc. - I never, or only rarely change the original data identity entry because that would require changing all the related links. So, when you click on the link to go to Cynosure you will note the web address you will see on your browser still is http://www.dolphin24.org/EyeNoSure.html. Every time I went to to the database for either boat, for whatever reason, I saw the other boat right next to it. Its not hard to believe they were the same boat, but it is hard to believe they had found each other in the database! March 9, 2009 - An active day for Enticement. On a lead provided by Ed Purcel (Just Friends) your webmaster called Kathy Holdridge who confirmed that she and her husband had owned Enticement. They bought her from a guy named Smith who had her on the hard for a couple of years. They had the boat from the 1970's to the early 90's. She has a bunch of records somewhere and we hope to find out more about this boat. Stay tuned. May 11, 2009 Going through some old pictures that Eric Varty (Canopache) took when he went to see Cynosure in October, 2007, your webmaster came across this photo of Cynosure's transom hatch. Compare it to the unusual hatch in the photo above - it pretty much confirms that Cynosure was Enticement. Also note the only one ventilator scoop on the starboard side. April 13, 2012. Another possibly related Dolphin investigation required a follow up call to Kathy. We have zeroed in on when she and Milt bought Enticement - probably about 1979. 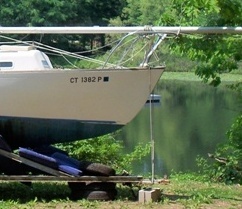 It had been out of the water for a couple of years and needed work - and Milt did a lot of work on this boat. She was special to him. She recalls Milt seeing the boat and calling the owner from a phone booth and making a deal.